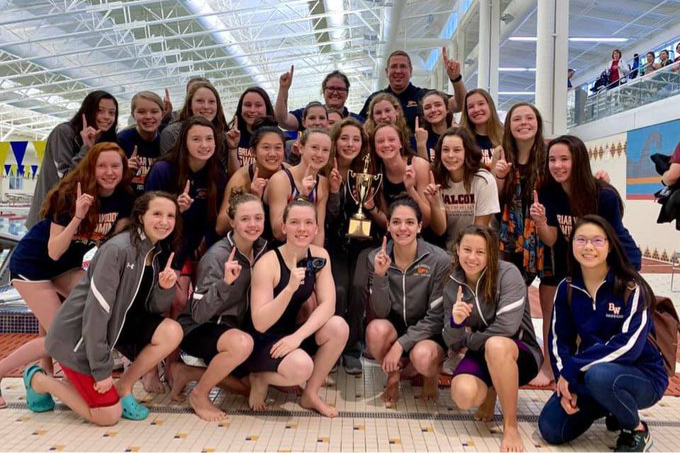 Sterling, Va. — Led by junior Abby Harter and sophomore Mackenzie McConagha, the Briar Woods High School girls swim team claimed the VHSL Region 5C championship on February 2 in Sterling. Harter won the 50-yard freestyle and 100-yard breaststroke, while McConagha won the 100-yard butterfly. Both Harter and McConagha helped the Falcons win the 200- and 400-yard freestyle relays. Also on the girls side, Broad Run senior Kayla Graham won the 200-yard individual medley, Freedom sophomore Jennifer Luong won the 100-yard freestyle, Rock Ridge freshman Tatum Wall won the 500-yard freestyle and Potomac Falls sophomore Janika Perezous won both the 100-yard backstroke and 200-yard freestyle events. On the boys side, Rock Ridge junior Trace Wall won the 100-yard freestyle, leading the Phoenix to a second place team finish. Broad Run senior Gavin Bock won the 100-yard backstroke, Briar Woods junior John Moore won both the 50-yard freestyle and 100-yard butterfly and John Champe junior Sam Oliver won the 200- and 500-yard freestyle events.